MELBOURNE is preparing for a physical barrage from its former star forward, the Tigers' Adam Blair, at AAMI Park tonight. Blair ran for 94m and 119m in his past two games against the Sea Eagles and Eels. And it is this power running with the ball that has the Storm worried, despite the Premiers enjoying a 12-game winning streak. "Everyone knows he's going to be very aggressive coming up against his old club. I'm sure he's going to be very fired up," Melbourne five-eighth Gareth Widdop said. Storm winger Matt Duffie backed up those comments, saying Blair runs the ball hard and has good footwork at the defensive line. Before losing 26-0 to Manly last round, the Tigers showed strong glimpses of form with wins over the Panthers and Eels. "They've been a bit up and down, but we're going to have to be on our game otherwise we'll get beat," Widdop said. Wests Tigers skipper Robbie Farah has been in outstanding form, while prop Aaron Woods's strong running game has been tough for opposition defences to break down. 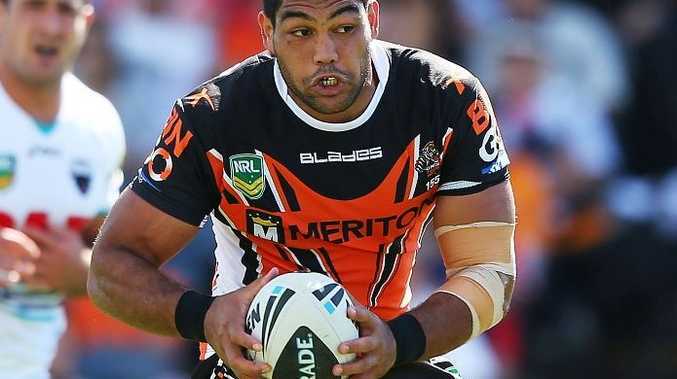 Woods is ranked No.1 at the Tigers for metres gained this season.